Adolf Hitler’s armies stormed over Poland’s border on Septem­ber 1, 1939, in what became known as the first blitz­krieg—“light­ning war.” Soviet dic­ta­tor Joseph Stalin has­tened to claim his share of the spoils under the terms of a sec­ret pro­to­col in the Molotov-Ribben­trop Pact signed in Mos­cow the month before, sending his forces into east­ern Poland, where on this date in 1939 they met the ad­vancing Ger­mans at Brest-Litovsk on the River Bug (effec­tively the demar­ca­tion between the two occu­pa­tion armies). On Septem­ber 22, as Ger­man troops with­drew wes­tward out of the Soviet “sphere of in­fluence” in Poland, the two in­vaders cele­brated a victory parade in Brest (in today’s Bela­rus). By month’s end, all Poland was under one tyranny or the other. Despite their easy vic­tory, the Ger­mans lost 13,000 killed and over 27,000 wounded. The Soviets lost less than a thou­sand because most com­bat was over by the time they invaded Poland on Septem­ber 17. Polish casu­al­ties were high: 70,000 killed, 133,000 wounded. Over 900,000 Poles became pri­soners of war: nearly 700,000 in German hands, 217,000 in Soviet hands. After Ger­many’s inva­sion of Soviet Union in June 1941 (Opera­tion Barba­rossa), between 3.3 and 3.5 mil­lion Soviet POWs were tar­geted for destruc­tion by Nazi policies of neglect, abuse, mal­nu­trition, and mur­der, mostly by shooting and gassing. No less than 200,000 Soviet pri­soners died during forced labor, down from a peak of 631,000 in the summer of 1944. By 1944 Poland was the site of 9 out of 40 Nazi death camps, whose in­mates in­cluded Polish civil­ians, POWs, Euro­pean Jews (over­whelm­ingly), Roma (Gypsies), and polit­i­cal pri­soners. Not until the sum­mer of 1944, when the ad­vancing Red Army over­ran the aban­doned camp at Majda­nek on the out­skirts of Lublin, Poland, where 79,000 peo­ple died (59,000 of them Polish Jews) did the true ex­tent of the Nazis’ geno­ci­dal poli­cies become clear. Six months later, on Janu­ary 27, 1945, the Soviets liber­ated Auschwitz-Bir­ke­nau, the largest Ger­man labor and death camp where at least 1.3 million died—around 90 per­cent of them Jews but also 15,000 Soviet pri­soners at Auschwitz and thou­sands more at Bir­ke­nau. Ovens, mounds of corpses, and ema­ci­ated survi­vors testi­fied in words, photo­graphs, and motion pictures the depths of Nazi crimes against so-called Untermenschen (subhumans). 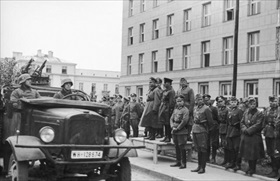 Left: German-Soviet military victory parade in Brest-Litovsk, Poland (today in Belarus) on Septem­ber 22, 1939. Both inva­ders saw the pro­pa­ganda value in holding the parade, which was meant to dis­play the power of the newly formed “Soviet-Nazi alliance” to the whole world. 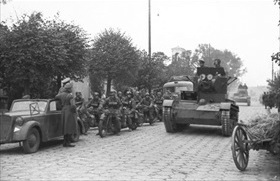 Right: Rolling Soviet tanks and German motor­cyclists. The Soviet contri­bution to the joint victory parade was modest—a mili­tary band and a few bat­ta­lions—because Red Army sol­diers were tired after their protracted march to Brest. 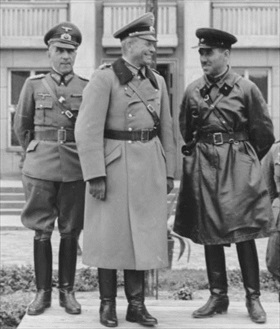 Left: Sharing the reviewing stand in Brest were (l–r) Ger­man Gene­ral of the Infan­try Mauritz von Wik­torin; Maj. Gene­ral Heinz Gude­rian, com­mander of Ger­man pan­zer (armored) forces in Poland; and Brig. Semyon Moisee­vich Krivoshein, com­mander of the Soviet tank bat­talion that took Brest. 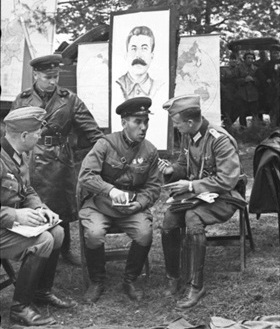 Right: German and Soviet person­nel share experi­ences amid Brest vic­tory parade dis­play material. After the parade the Ger­mans with­drew to the west­ern bank of the River Bug, and the Soviets took control of Brest, which lay on the east­ern bank, as well as the rest of East­ern Poland (now West­ern Belarus and Western Ukraine).